We all know that one person in our lives that you dread having to shop for; whether it's for a birthday gift, special occasion or holiday gift giving. You want to give a gift that is special and unique but you just don't know where to start. Well, worry no more -you can start your gift shopping right here for the most unique variety of one of a kind handmade gifts that will be treasured for years. 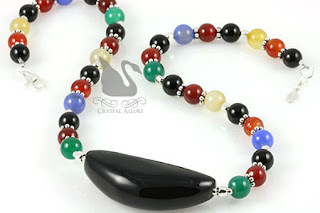 Crystal Allure offers one of a kind beaded jewelry designs handcrafted with gemstones, cultured pearls, Swarovski Crystals, czech glass beads and artisan lampwork glass beads. Just click on any link below to view our growing collection of unique, handcrafted beaded jewelry gifts. Our beautiful beaded earrings are the perfect unique gift to give -or get for yourself! 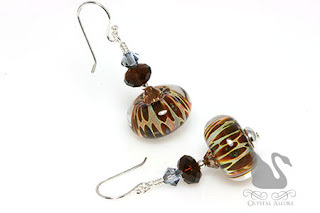 Enjoy browsing our full collection of beaded earring designs that include gemstone earrings, lampwork earrings, birthstone earrings, crystal earrings, pearl earrings and specialty collections -Heart Earrings, Leaf Earrings, Snowflake Earrings and much more! Stylish watch bracelets like no other! 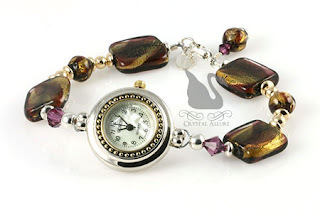 Our elegant watches make for a unique gift because we offer designs that stand out from traditional watches. Pick one up as a gift and one for yourself! 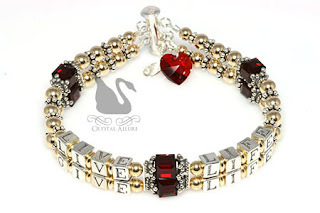 The beauty of wearing a bracelet is not only does it catch the eye of onlookers, you too are able to enjoy the beauty of the piece. 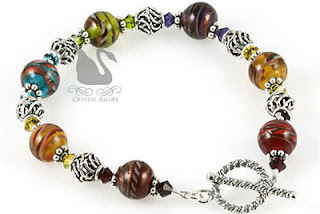 We carry a growing collection of beaded bracelets perfect for anyone on your list! An we highly encourage you to pick one up for yourself! 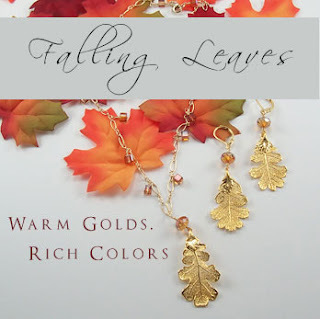 Exquisite Leaf Jewelry is a gift from Mother Nature! Designed with a variety of unique leaf charms, pendants and beads that we have gathered up -just for you! Do some leaf peeping at our Leaf Jewelry Collection. Keys are just keys, but add an adorable beaded keychain and it gives a whole new meaning (and look!) to carrying your keys! All our key chains can also be used as purse charms, as well! That makes them perfect little gifts that are Hot Sellers! The hottest new look for all ages! 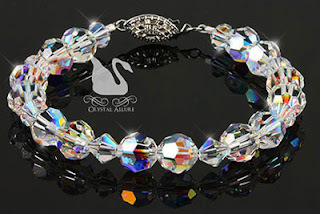 Shimmer and shine in these effervescent and illuminating crystal jewelry. When Autumn arrives it's time to start thinking about Teacher gifts. Don't be that person who gives the teacher another coffee cup or apple chatzke. Give him/her something truly unique!